Rediff.com » Movies » WATCH Brijesh Sandliya SING! 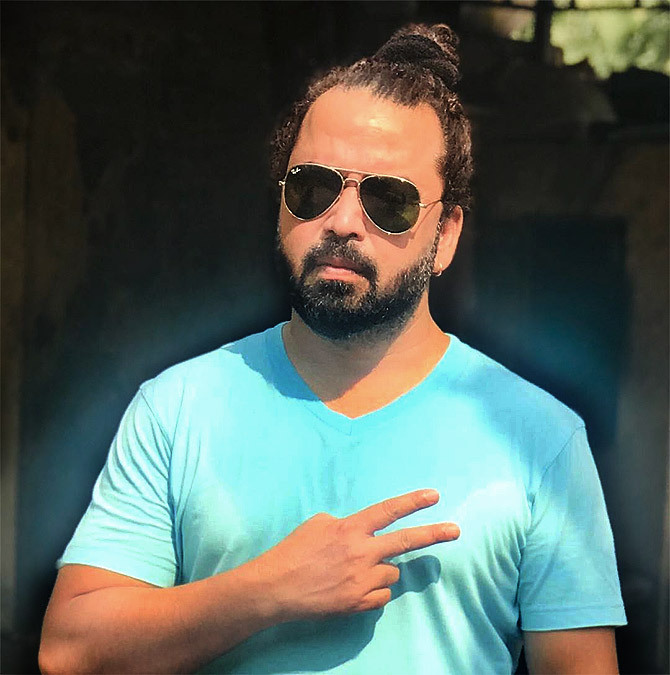 After sleeping on the footpaths of Mumbai and struggling for years, Brijesh Sandilya finally found his footing in Bollywood. Sandilya has sung in blockbusters like Tanu Weds Manu Returns, Airlift, Shubh Mangal Saavdhan, Golmaal Again and Badhaai Ho, and has several more films lined up this year. "A person talks about his weak points only when he is successful. I thank God that today, I can tell you all this," Brijesh tells Rediff.com Contributor Mohnish Singh. I was around 18 when a close friend made me realise that I had a good voice and that I should make a career in singing. Before this, I always thought I was a useless, good-for-nothing fellow because I was extremely poor at studies. Even securing passing marks was an uphill task for me. I failed thrice in Standard 10. I used to think that I would not be able to do anything in life. I used to laze around and kill time in my village. I belong to a small village in Uttar Pradesh, Mahadeva. I come from a family of farmers. Even I would go to the fields and toil all day. A person talks about his weak points only when he is successful. I thank God that today, I can tell you all this. 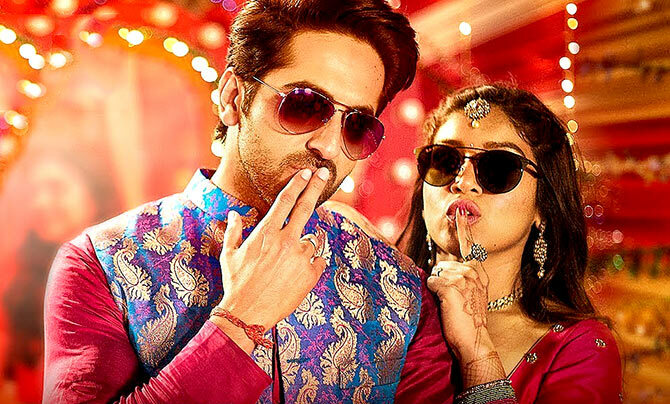 IMAGE: Ayushmann Khurranna and Bhumi Pednekar dance to Rocket Saiyyan in Shubh Mangal Saavdhan. How did your family react when you told them about pursuing a career in singing? After failing thrice in school, I left home and went to live with my maternal uncle and grandfather in Chauri Chaura, Gorakhpur. My grandfather has always supported me in everything. After that, I went to Allahabad and learnt music at the Prayag Sangeet Samiti. At the end of 2001, I came to Mumbai and lived on the footpath. I spent a year-and-a-half living with vegetable sellers, cooking food with them and sleeping there. When things did not turn out as I had thought, I went back to my hometown where I got an offer to sing in a band. After much deliberation, I accepted the offer. In the following years, I got another chance to come to Mumbai when I participated in Indian Idol Season 2. Neha Kakkar and Monali Thakur were a part of the same season. I could not clear the piano round and was eliminated even before entering the top 12. Later, I participated in Sa Re Ga Ma Pa.
After coming out of Sa Re Ga Pa Ma, I got to meet Sneha Khanvalkarji. She was scoring music for Oye Lucky! Lucky Oye! I did a voice test for her, which she really liked. That is how I got my first song Hooriyaan. After Hooriyaan, I would sing one or two songs every year. I got to sing in several big films, but those songs did not fare that well. In 2015, I got to sing for Tanu Weds Manu Returns. The song was Banno and it was a massive hit. IMAGE: Kangana Ranaut in the Banno song from Tanu Weds Manu Returns. Did your strained relationship with your family improve after you became a singer? My father and I were not on talking terms for seven years. We took a lot of time to break the ice, but when we did, he did not have much time left with him. He was diabetic and was not keeping well. I feel bad that my father could not enjoy my success. A couple of my songs released before he fell seriously ill.
Everybody in my hometown knew I was a singer in Bollywood. So doctors and other hospital staff would cooperate during my father's stay in hospital. Who is your favourite composer and singer? Among singers, I like Kishore Kumarji a lot. His voice stands out in the crowd. One cannot help but sing along when his songs are played. I like (Mohammed) Rafi saab also. I cannot imagine that period of 1980s, 1990s without Udit Narayanji. I loved his voice. He has a very original voice. After Kishore Kumar, Rafi and Mukeshji, if there was any other singer who was blessed with a distinct voice, it is Udit Narayanji. Among composers, Amit Trivediji tops the list. There's also A R Rahman. From yesteryears, SD Burmansaab and Khayyamsaab are my favourites. IMAGE: The Golmaal Again title track. 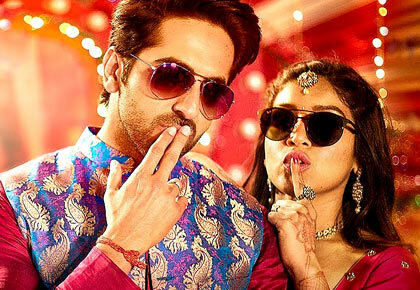 Remixes have taken over Bollywood. How do you look at the trend? I like it and I have a valid point for that. If somebody remixes my song Banno 20 years later, why would I feel bad about it? I would feel happy that somebody gave a new lease of life to my song and made it popular among the new generation. The next generation will sing my song. Secondly, if somebody recreated it, it shows that my song was powerful and that is why it has been reused. I feel there should be no comparison between an original song and its recreation. If somebody makes me sing Banno after five years, I won't be able to sing it the way I have sung it before. People criticise that composers and singers destroy original songs when they remix them. I would like to say there is nothing like that. Everyone in this world gets inspired by one person or the other. People, who criticise remixes and recreations are, in fact, popularising them in a way, by talking about them repeatedly. What is wrong in recreating a 30-year-old song, which no one from the younger generation has heard before? Another trend that has been gaining popularity in Bollywood is that composers record one song with several singers and then decide which voice will be retained in the film. Earlier, there were only a handful of singers, so things were easier. Composers would work with their favourite singers and, to an extent, the audience would also patronise the musical jodi they liked. If we talk about the 1990s in particular, listeners were inundated with songs by Udit Narayanji and Kumar Sanuji. There was no other voice to listen to. But things have changed drastically over the years. Today, there is a long list of singers waiting for work. I don't know whether this trend is good or bad, despite the fact that my voice has also been replaced in many songs. The positive aspect of this is that if a composer has called you to sing a song, he must have thought your voice would suit that particular song. Nobody calls you just to kill time. A composer is looking for something new and fresh when he makes several singers sing the same song. Directors and producers want to add freshness to their music. Nowadays, even some actors want a new voice to sing for them. Another thing is that earlier, the money which would flow to one singer's account is now going to several singers. So what is wrong with that? It provides an opportunity to various singers. In which songs was your voice replaced? I had sung Afghan Jalebi in Phantom. Also, Tukur Tukur and Mann Ma Emotion Jage Re. If a song sung by me is not included in the film, it does not mean my voice is not worth it. Recently, I sang First Class in Kalank. But the makers found Arijit's voice suited the song better, so his voice was retained. I don't feel bad about such things.